You are here: Home / children's therapy / Music is Good for Your Brain! Would describe your child as a music lover? Probably most of you would and there is a good reason for that. The young child learns best through experiences that are integrated and multi-sensory. This means elements are linked, overlapped and in many cases experienced simultaneously within an activity. For young children, music and movement are almost synonymous. Movement is the primary way children interact with their world. Moving to music can help develop body awareness, spatial awareness, fine and gross motor skills, as well as cross-lateral coordination (crossing the midline of the body), and listening skills. Listening for specific sounds, responding to changes in tempo and volume, and listening for directions can help with developing focused listening and self-regulation skills. There are many children that are more likely to imitate sounds or words when a “sing-song” voice is used. Music enhances vocal play and it is through vocal play that children learn to form vowels and consonants, say words and phrases, and imitate rhythm and vocal inflection. Music helps children gain a sense of cadence, tonality, and melodic contour while teaching them about breath support, turn-taking, and the body language of communication. Materials- a selection of pans, pan lids, bowls, plastic pots, cups and spoons made of metal and wood, heavy string. Hang the pan lids on a heavy string that is tied between the cupboards doors- they make better noise that way. Put all of the pots and pans on the floor. 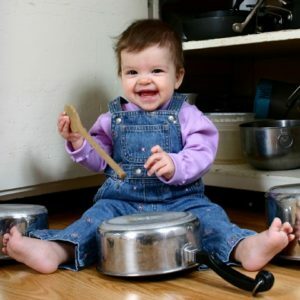 Hand over the spoons to your child and let the exploration and the music begin. This game will use your child’s ears are part of listening to music. Find a toy that plays music continuously. Turn on the music and hide the toy. Help your child to find the toy by using their ears. 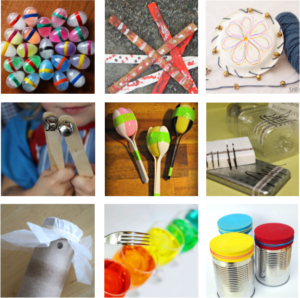 There are numerous instruments you can make from simple things you might have laying around your home.